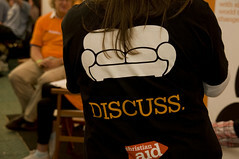 I was at a couple of Rob Bell’s events at Greenbelt, ‘Drops Like Stars’ and ‘In Conversation’. Despite the huge queues for Drops Like Stars, it was worth it. I knew roughly what he would say, having read the book, but I like watching how he presents things. It’s one of the reasons I enjoy his books so much: he writes the way he speaks. The ‘In Conversation’ piece was really interesting… I’m interested in what happens when it’s unscripted, when you’re put on the spot and it’s just a dialogue between people rather than a full-on presentation. A couple of things he said stood out for me. I’ve heard him speak about this before, but it gets me every time. I wonder what it would look like if we really started to live that out? In so many churches I fear we’ve turned communion back into this religious ritual, rather than it being an everyday occurrence. Wasn’t that the point initially? It’s bread and wine.. it’s whatever you’ve got to hand, that everyone has access to, and it’s not kept just for the religious people. If the Eucharist truly is the Good Gift, what does it mean for us to be a Good Gift to our communities? We become the body, that was broken, and we become the blood, that was poured out. We break ourselves & we pour ourselves out… on their behalf. This phrase just grabbed me. Hope is real. Hope is not a myth. Anyone else there? What did you think? One of the best things I did at Greennbelt was attend an evening worship event run by Church on the Corner. Decelerate: New Ways of Inhabiting the City was a reflection on the hectic, fast-paced rat race we are surrounded by living in the city. It’s something I think about regularly. I love living in the city: I love all the hustle and bustle, the interaction, the diversity. Yet I need to slow down regularly. And maybe that’s where Sabbath comes back in again. But it was fantastic to sit down, slow down, and be reminded that I am not a slave, that nobody cares what I do for a living, that the world keeps on spinning when I stop for a minute. And as we were reminded during the worship, it doesn’t matter if you win the rat race, at the end you’re still a rat. Rather than lyrics, I though I’d highlight a few bands I got to hear at Greenbelt over the weekend. 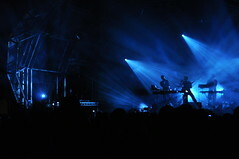 Röyksopp: Played on the main stage, and I loved it… high energy, lots of fun. I’ve definitely been getting into electronica a bit more lately! I enjoyed the woman dressed as an owl… purely for entertainments sake… and the lighting for the show was great. So maybe I enjoyed it for the visuals as much as the music…! The Invisible: I’d never heard of these guys before, but their debut album has been nominated for a Mercury prize. Foy Vance: It’s always a pleasure to see Foy play, and even more so to have him be the last thing I see at Greenbelt. Agents of Future: These guys lead worship at the service on Sunday morning. I’ve gotta be honest and say that I don’t think it worked – I love the music and loved the arrangements, but it wasn’t ideal for leading communal musical worship, pretty hard to sing along to. BUT I would really love to hear more of their stuff, so check them out. Duke Special: Greenbelt was the first time I’ve actually seen Duke play live, and despite missing the start of it (while I was off at another session) I really enjoyed what I did see. There you have it… musical recommendations from Greenbelt. What’s been the soundtrack of your week? Anyone see any other great music at Greenbelt? 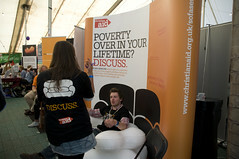 I got the chance to meet & talk with a few of the TWLOHA UK crew at Greenbelt over the weekend. I’ve been following their story for a few years now, after a friend introduced me to it back in Chicago. I love it. There have been so many points along my journey when their hope, and their words, have been the thing that has saved me. To read words that can bring you back to life… there’s something so precious in that. To Write Love On Her Arms is a non-profit movement dedicated to presenting hope and finding help for those struggling with depression, addiction, self-injury and suicide. Find out more on the TWLOHA website.